After a very long 14 year wait, Super Troopers 2 is finally happening! Star Erik Stolhanske shared the first photo from the set as things got underway this morning. He is joined by fan-favorite Kevin Heffernan. And we're sure to get a look at the rest of the Broken Lizard gang as shooting continues throughout the fall. Broken Lizard launched an IndieGogo campaign earlier this year, with a goal of $2 million. The comedy troupe arrived at that goal in just one day. The production has gone onto raise over $4.5 million. And now, the boys are putting that money to good use as they bring their Vermont State Troopers back to the highway for a lot of fun and some danger. It was reported back in March that Super Troopers 2 already has distribution. At this time, the Broken Lizard gang, which is comprised of Jay Chandrasekhar, Kevin Heffernan, Paul Soter, Steve Lemme and Erik Stolhanske, have not bestowed fans with a complete rundown of the plot. What they are planning is a surprise. And hopefully it's a good one. Super Troopers was released in 2002 and was directed by Jay Chandrasekhar. Always looking for action, five over-enthusiastic but under-stimulated Vermont State Troopers raise hell on the highway, keeping motorists anxiously looking in their rear-view mirrors. 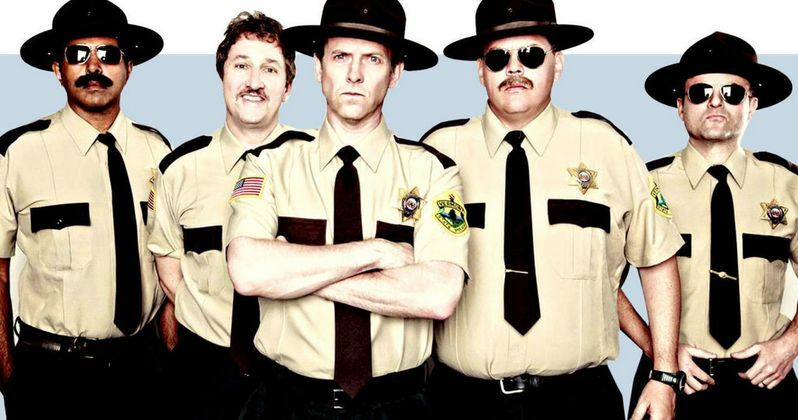 Between an ongoing feud with the local cops over whose you-know-what is bigger, and the state government wanting to shut them down, the Super Troopers find themselves precariously and hilariously heading toward calamity as they try to avoid extinction. The film quickly became a cult comedy favorite soon after it's release, and it lives on in infamy to this day. While no plot details have emerged as of yet for the sequel, backers who pledged at least $10 to the cause got access to the script. None of those backers have revealed anything as of yet, keeping in the spirit of the team's goal to shock and surprise its fan base. It's probably a given that most fans aren't really going to Super Troopers 2 for the plot, anyway, but are more excited about the weird jokes and quotable dialogue. You can check out this photo from the first day of filming. At this time, the long-awaited sequel does not have a release date. Super Troopers 2 Posters: Who's Ready for Another Mustache Ride?